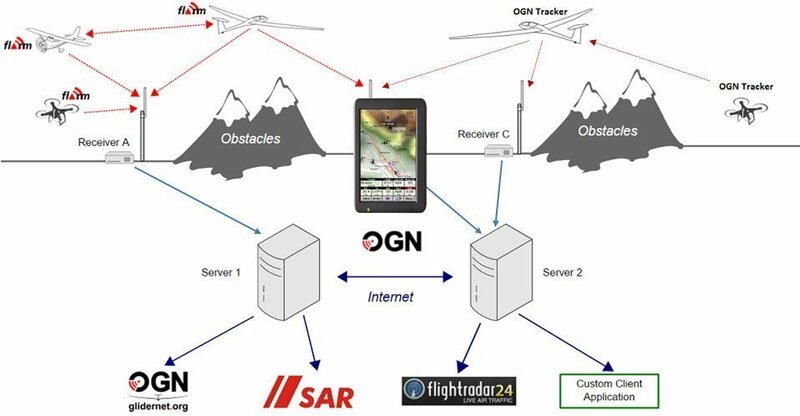 Did you know that your Oudie can act as a receiver for the Open Glider Network? Did you know that it extends Open Glider Network’s coverage this way? When an Oudie is connected to a Flarm, Oudie Live will broadcast all Flarms targets the Oudie could see back to OGN. That makes it a mobile floating OGN receiver in the sky. In areas with no ground-antenna OGN coverage Oudie Live will take care to relay information from all Flarms in range and feed that to the OGN system. No additional setup required. The only limitation in this process is internet connection of your phone in the sky. Our experience is that while it does occasionally loose connection the transfer chunks are so small that sooner or later the connection is back. Our test took it to extremes in terms of what cellular networks allow. We flew mostly very high (3000 m and up), switched network providers and countries countless times.
. It’s the perfect way to guide young pilots or stay with your team mates?
. All of this works on a paraglider with Oudie 4 just the same.